Fake books are derived from jazz lead sheets, which were originally used by jazz conductors to lead a band. A lead sheet is not a complete score; it usually contains only the melody line, the chords, and maybe some notes about which instruments play where. Other than that, lead sheets are pretty sparse. A jazz band leader has to know the music inside and out by memory and use the lead sheet more as a reference point than a road map. The chord symbols in fake books are called changes. Reading changes goes all the way back to the Baroque period, when writing in figured bass was common. Often, the harpsichord player would improvise the harmony above the printed bass line, based on the numbers below the note. This is known as figured bass. Harpsichordists had to invent the accompaniment themselves using the figured bass as a guideline, assuring that each performance would be different, much like jazz! Figured bass went out of style in the Classical and Romantic Periods. Early jazz musicians studied the Baroque composers, and no doubt picked up on this method of composition and adapted it to their own needs. Musicians in jazz bands find it convenient to play from fake books because they are available in different keys, including C (concert-pitch instruments), B-flat (trumpet and tenor saxophone), E-flat (alto and baritone saxophones), and bass clef (double bass and trombone). Each version has the exact same page numbers, so band leaders can simply call out a page. That way, each band member can easily pull up a popular tune and already know what changes and rhythms to use. All lead sheets or fake books have two primary components: the melody and the chords (changes). Fake books for guitar may also have guitar tablature. 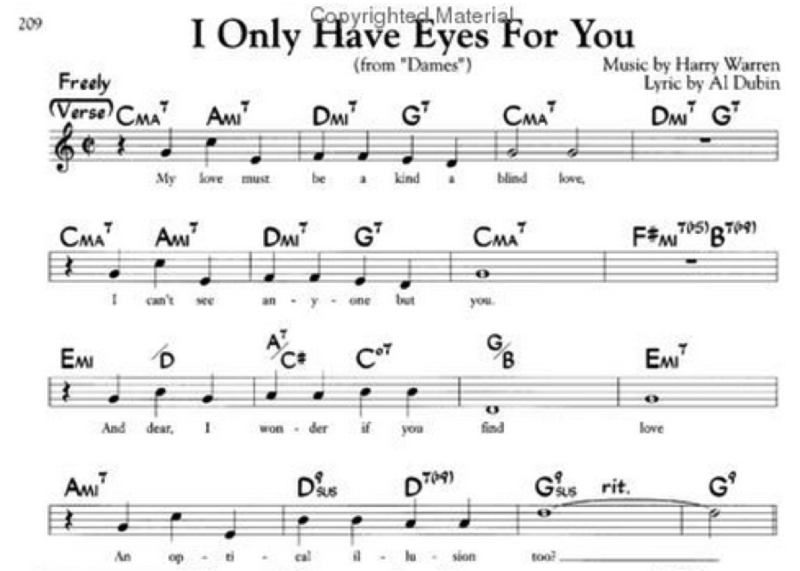 In the example above, “I Only Have Eyes for You’, you can see that you are only given the chords, written above each line, and the melody. So how do you make this into music? A modest knowledge of music theory is necessary to make fake books come to life. How the chords and melody are interpreted depends on the instrument you play. As a pianist, you will be able to create the entire song with your own two hands! The first time playing through, simply play the melody by itself to become familiar with it. The next time you play through the tune, just play the chords as written with the left hand, with no ornamentation or improvisation. That way you can get an idea of what the harmony sounds like. Having just played the melody the first time, your ear should start hearing how it fits in with the chords. Then when you feel you’ve got a good handle on the melody and block chords, start experimenting with the left-hand accompaniment. You can start by building each chord from the bottom one note at a time, instead of playing all the notes at once. In the example, each chord gets two beats, meaning you can play 4 1/8th notes. This will give it a nice, rising arpeggio effect. If you are playing the above example, play the melody in the right hand and in the left hand build the C Major 7 chord from the bottom up, one note at a time: C, E, G, B-natural. As you keep practicing, you’ll start to hear the style and rhythm of the song. Then, you can begin modifying the left hand to enhance the right hand melody. You are only limited by your knowledge of music theory! Brass and wind players don’t have it as easy as the pianists do; unfortunately you can’t accompany yourselves! As a brass/wind player, when you play from a fake book or lead sheet, your primary concern is going to be the melody. The piano, in a jazz setting, is considered a rhythm instrument, and therefore uses the left-hand chords and accompaniment to help provide the rhythm. Even though you’re playing the melody, you still have to understand what the chords mean, as you will most likely have to improvise through the chord changes! The best approach for brass/winds is to first become familiar with the melody. As you play through it the first couple times, listen to the direction of the melody. Where are the cadences? Does it sound major/minor? What kind of accompaniment fits this melody? Next, play the chords on a piano. (If you don’t have access to a piano, arpeggiate the chords on your instrument.) Start with the root note and build the chord upwards. You’ll be able to hear the quality of the chord (major/minor, etc.). Playing the chords also gives you an idea of the direction of the melody, i.e. where it’s leading, what the style is, etc. The improvised solos of many famous jazz players like John Coltrane are mostly stylized arpeggios of the chords, nothing more. Sometimes a chord in itself can be a melody. Arpeggiating these chords on your instrument will help develop your inner ear, as well as greatly increase your technical proficiency on your instrument. Once you understand the chords, try improvising a bass line that outlines these chords. Now you have to think like a bass player! This is a crucial step to developing a good ear for jazz. Understanding the bass can greatly enhance your own improvisations and you will hear the melody in a new light! For a real experiment, try recording yourself playing the new bass line and then play the melody over it. You will be amazed at your capabilities! Most fake books don’t include any drum markings, so a lot of the drummer’s job is to determine what kind of beat or style will fit with the melody. Usually the style is indicated at the very beginning of each song. Most drummers will read the melody on the lead sheet and then plan their fills around the melody and rhythm. The best thing you can do as a drummer is listen to as much music as possible and have a basic understanding of the most common jazz styles like swing, latin, bossa nova, bop, big band, etc. Most fake books won’t have songs that are too obscure, so knowledge of the most common jazz styles should suffice. Some fake books come with a CD, which is a great resource. Start listening! Chord changes are a language unto their own. Half of reading a fake book is deciphering what all the chord symbols mean. Here is a list of the most common terms you’ll see. The above example, “I Only Have Eyes For You,” is the source for the following chords symbols so you can see how each one fits in. All symbols are given in the key of C.
7: the default seventh is a minor seventh above the bass note. Major sevenths will be indicated separately as maj7. C7: a C-major chord with a minor seventh, the common blues chord – C, E, G, B-flat. Cmin7: C minor chord with a minor seventh – C, E-flat, G, B-flat. Cmaj7: C-major chord with a major seventh – C, E, G, B-natural, sounds melancholy. C7(flat 9): flat nine chord; a C7 chord with a flat ninth interval (D-flat). The 9th is always played an octave above the root C to avoid too much dissonance. C°7: C half-diminished 7 chord; a C diminished triad with a minor seventh – C, E-flat, G-flat, B-flat. Cø7: C fully diminished 7 chord; a chord built with all minor thirds, i.e. a double-flat seventh – C, E-flat, G-flat, A.
G/B or A7/C#: when you see a chord with a slash and a note below it, it means play the chord above the slash with the note below the slash in the left hand bass. So an A7/C# would be an A7 chord in the right hand and a C# in the bass. This is only used when the composer specifically wants a certain note in the bass line, and not the bass player’s usual wacky improvisation. That should be enough to get you started with fake books. It’s one of those things you get better at the more you practice. Your knowledge of music theory will improve and you will learn many new songs. It may be a little daunting at first, but once you get going, it is actually very easy and fun! Next step- improvise over the chords! The subtle differences between fakebooks always intrigued me. Depending on who published the chart, and depending on what year it released, there are typically a few differences from fakebook to fakebook. It speaks to what jazz music is in a bit of an abstract I guess. Constantly evolving! Sorry, the Real Book was NOT the original Fake Book. Fake books started back in the 1940’s. The Real Book did not come out until the 1970’s. Nor was the term “fake book” created in response to the Real Book. In fact, the opposite is true. The Real Book was actually a play on words from the earlier “fake books”. It was called “real” because it much more closely resembled, despite it’s many errors, the actual (real) harmonies and melodic phrasing jazz musicians would play at jam sessions and gigs; unlike the older fake books that copied harmonies inaccurately from the right hand of the old printed piano leadsheets. This is pretty common knowledge any professional jazz musician would know.